Cognitive Remediation: Address the core neurological deficits. 10 neurofeedback sessions provide the groundwork for the brain to begin re-training itself, by learning from its own cortical activity, reducing symptoms of stress, anxiety, inflexibility, etc that impede fluid learning. Daily practice with carefully selected, targeted games (electronic and table-top) develop brain functions required for effective learning. Specific movement- and mindfulness-based activities integrate brain functions and develop basic learning skills so that processing can occur more smoothly and completely. Explicit Executive Function Skills Training: Teach students HOW to be successful. Introduction to the concept of “meta-cognition” – learning about learning – lays the groundwork for developing enhanced executive function skills. Children take more responsibility for their learning. Interesting, real-life project-based activities teach skills such as organization of time and materials; setting priorities; accessing working memory; and developing learning and test-taking strategies. Family Support: Enable the entire family to be a part of the process. Learn how to support and advocate for your child, using Brighten the Brain's proprietary tools. Historically, instruction at school was adequate for most learners. Currently with the increase of children learning in different ways, we are in need of more specific training strategies. Recently many researchers and authors have brought to our attention how the concept of “just trying harder” is not helpful for children who need a different learning paradigm. The question for teachers becomes “Can I teach the skills needed effectively?” This is a great paradigm and often teachers in the public school system feel overwhelmed with this challenge. Often schools are able to provide accommodations; however, if a child has fallen behind, it is difficult for them to catch up. If the child qualifies for special education support, they are sometimes able to get more specific training. However, many children don't qualify for these services. Furthermore, often the diagnostic level of a learning disability is not enough to change the underlying functional concerns. Brighten the Brain gets results in an efficient and elegant way. We examine the coevolving system for the child, the family and the school system simultaneously, to look for the most efficient and elegant client support system to create optimal functioning for the children we work with. Executive function is an area that goes across the disciplines of psychology, education and physiology. Often what the school does is provide a class of explicit instruction targeting executive functioning skills such as organizing, note-taking, and so on. While this addresses the concerns at the level of skills development, it does not address the underlying processes or brain structure underneath the learning process. The parents, the child, and the school system often feel as if they're hitting their head against the wall when attempting to help a child pay attention, if there's an underlying working memory, processing speed, and/or other disabilities underlying the learning concerns. We have found that it is necessary to address the underlying brain integration at the neurological level to be successful with children who have executive function issues. We use cognitive remediation strategies that go one step beyond accommodation. The strategies address the underlying structural ability to sustain flexible and focused attention, regulate emotions and behaviors, navigate daily transitions, improve processing speed, independently initiate action and strengthen the working memory. As we address the neurological and cognitive issues underlying the behavioral symptoms of attention, impulsivity, and learning differences, we are then able to move the child towards a more explicit instruction model. Much of the time in the traditional model, explicit instruction occurs before there is an efficient pathway of neural networks to support that education. We have found that a direct family support and education model -- one that encourages the family to notice, acknowledge, and further understand the underlying foundational issues -- to be helpful. We support the parents by helping them to identify the underlying stuck points in the learning process and how to address these systemically at home and at school, while at the same time we are improving the learning capacity of the child. This supports them in advocating for their child in a cohesive, efficient, and effective manner. Simply put, as a family (both the child and the parents) learns more about learning they are able to advocate for themselves and support each other. It is important to remember that with treatment, there is a continuum of progressive functioning over time. Where your student starts and what happens during the time we are working together will affect the amount of progress each child makes. 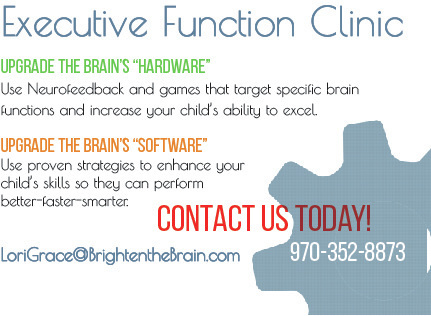 We have designed this program to work with progressive skill sets that can be addressed consecutively within each Executive Function Clinic. We have found that the students enjoy the positive, affirming class experience, as well as the increase in ease they experience as the neurological foundations are addressed. 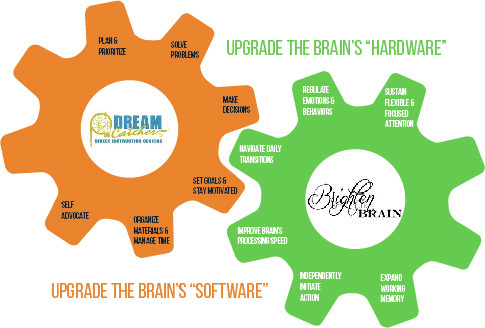 As we sit with parents on the edge of understanding the complexity of their child's brain we often see a reorganization as the systems that support this child as well as the brain itself move towards optimization.